Unsung Romantic Music Hero is Bella Salomon. The 1st question you are probably asking is: Who was Bella Salomon? Answer: Felix Mendelssohn’s maternal grandmother. The second question is, what did she do for her grandson? In 1823 (or possibly 1824), she presented her grandson with a gift. It was to alter the course of his life. Also, it was to alter the course of musical history. The gift was a copyist’s manuscript score of J.S. Bach’s St. Matthew Passion. She recognized the Passion was one of the most deeply spiritual works ever written. It was almost unknown during the time of Mendelssohn. She had it copied by Eduard Rietz for her grandson. Felix struggled with this special project for 4 or 5 years. Finally, his dream was realized: He rehearsed and conducted the Passion at the Singakademie on March 11, 1829. Portrait of Mendelssohn by the English miniaturist James Warren Childe, 1839. The romantic era revived counterpoint. One era contrasts another. Melody with accompaniment mostly characterized the rococo period and the classical eras. 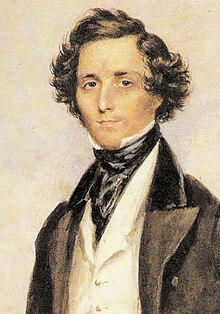 Mendelssohn brought counterpoint to the Romantic era. Because of him, it became a key element. But, we have cause and effect. Had Felix Mendelssohn’s maternal grandmother, the unsung romantic music hero, not given him the copy of the St. Matthew Passion, Felix could not have made it known. Later Brahms was to embraced counterpoint’s use with melody. With this in mind, my the internal link contrasts Brahms and Wagner. In the above youtube, has me playing Mendelssohn’s Wedding March. I have been called Sarasota’s Wedding Pianist. On Dec. 20, 2017 will begin playing the piano at the Gasparilla Inn. It is pictured below: Christmas through Easter, six nights weekly. The 1924 Steinway Grand as just been refurbished.